Cape Hatteras Marine's Boat Mats are made from 100% recycled materials, in the USA! 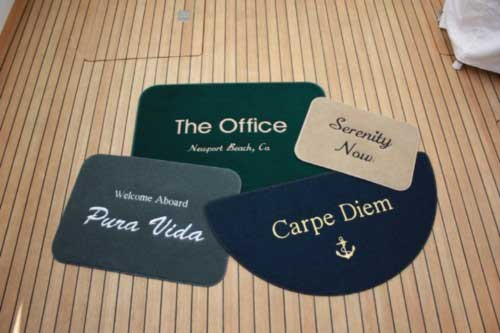 These unique Custom Embroidered Boat Mats can be personalized with your choice of font, color and personal message. Boat Mats are made from beautiful yet durable marine grade carpet that's mold, corrosion and UV resistant. Cape Hatteras Marine Personalized Boat Mat Medium 17"x24"
Cape Hatteras Marine Personalized Boat Mat Small 12"x17"
Cape Hatteras Marine Personalized Boat Mat Large 21"x30"
Cape Hatteras Marine Personalized Boat Mat Semi Circle 17"x33"
Cape Hatteras Marine Light House Boat Mat - Free Shipping!